Before continuing with our impressions, to say those who still do not know what Splatoon is, we encounter an action game in the third person especially competitive online multiplayer oriented team, but also has a campaign for a player and surprisingly well resolved entertaining. 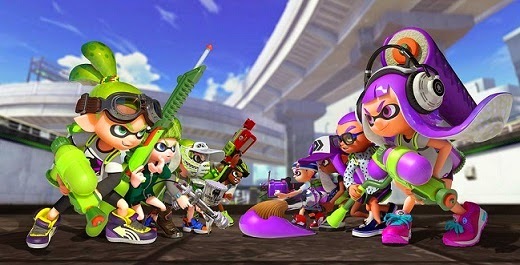 One of the unique features of this new saga of Nintendo's has in the fact that here control an inkling, a race of humanoid squid able to change shape between human and shellfish. Precisely this is where the differences begin with the other games in the genre, and that controlling these beings what is shoot ink. Yes, as you read, Splatoon is a shooter is not going to kill the opposite, but to fill all of the paint color of our team, at least in its main gameplay. We have weapons of all kinds: paint snipers, guns, rifles, submachine guns, paint rollers, and so on. And all of them have a number of different variants that give a touch of depth to the game very well received. Something that has surprised us, at least for the first ten levels have risen, is how well balanced they are all weapons. In any game we've seen one that dominates everything else we have no sense at a disadvantage to anyone. 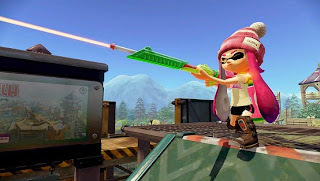 Yes, weapons such as the roller can surprise during the first few games and give us the feeling that they are too powerful, but nothing is further from reality, because once you start to understand how it works, you realize your weaknesses and learn to combat them. Moreover, we must emphasize how much fun is using all, transmitting a very good feeling with every shot and every attack. Our arsenal is divided into three different weapons: a primary, a secondary and special. The first will be to define the other two we have, so it is entirely possible that we like rampage with a certain type of shooting inks but not too excited us one of the other two weapons including the "pack". There are many different variations and combinations, and many are better or worse adapted according to the map and gameplay in which we compete, so we recommend that you learn to use various versatile to be all that you can in the battle. With regard to secondary weapons, these are usually things like grenades, bombs, mines or curtains paintings, although very careful with them because they tend to spend more ink than normal. Finally we have the special, which are the most powerful of all the game. You can use them need to fill a meter that will be carrying as we paint the scene and killing our opponents, ranging from changes in kraken up shields that make us invulnerable, guided missiles and bazookas, to name a few. Yes, the game is not only fire and little else, since there is a strong component platformer that will give us a huge mobility: the ability to transform into squid. With the push of a pass to the form of mollusk button, which will allow us to go through some bars, camouflage in the ink of our color and swim at full speed for her, also allowing climbing walls and structures as well as great leaps if we can catch enough momentum. Besides, the only way to recharge "ammunition" is swimming in our color paint, so you can get an good idea of the depth that reaches hide the title and advanced techniques and strategies that offer reaches its gameplay , with intense, fast and very frantic firefights where sometimes even produce very interesting and fully satisfactory duels when we coordinate well with our peers. Since it first showed at E3 last year, one of the criticisms most repeated that received Splatoon was the fact that one could look up and down by moving the GamePad, which in the final version will not be well and from the options menu we can choose whether to play using the gyroscope or only the right stick. So let us regulate the sensitivity and speed at which we move the camera. Having tried both, at the end we are left with the gyroscope controls, since a used once we have done surprisingly accurate, comfortable and intuitive, although this continues to be a matter of taste and to find the configuration that best suits your needs. After each multiplayer game we play, win money and experience points, allowing us to buy better weapons and accessories in the main city, a place very inspired by Shibuya (Tokyo, Japan) and from which will accede to all modes and shops . While we level, we find best items. Mention that clothing is not only aesthetic, since each will give different enhancers, as more defense, attack, refill ink faster ... Moreover, the clothes can also level up as many garments include one or several voids of skills, so if compete using that computer, this will level, which will allow us to unlock additional enhancer randomly. To give us a little homework to find the team you want, in the city we find the characters of other players in the form of NPC. To these we can inspect to assess their message Miiverse and check your computer. If any of your clothes we like, the order to which we can bring to us the next day to a special shop. As for the game modes, the truth is that there is spoiled for choice and all are now four against four. For items "for fun" and no score, we have the Territorial mode. Here our only goal is to fill all paint in the time limit given to us so that at the end of the game we have painted more than the opposing team. Although the GamePad we can see a map where we indicated painted by each team areas (which may also give us clues on where they are opposites, and this is updated in real time), it was not until the end of the battle when we say the scores for each team, so often have to "guess" during the clashes who is winning. This method has seemed hilarious and very original, because it forces us to change a little paint chip to focus on everything. Obviously, killing the opposing team is important, as this will send them back to base and make them lose valuable seconds that we use to fill all of our color, but not the objective. This is perfectly possible to make a bad relationship casualties / deaths, win the game and become the top of our team, although it is not normal. Speaking of comebacks, here when we are resurrected based on the GamePad can play any of our partners to make a giant leap into position, but careful with this technique, because the place where we will land is marked with a visible brand the opposing team, something they can use to leave us some kind of "gift" and kill us before we have time to react. The other game mode only unlock it when we are at level 10 and unlike Territorial, this will be rated so that our performance in each match will be valued, allowing rank up or down if we do not do too well. This range is used for matching system, so the more we go, we will find better players. A system that seems a success by Nintendo and we love to see in other online games company, and constantly encourages us improve and play with a purpose beyond the simple and pure fun (ie, reach to the top and be competitive). In this way we will play to win a certain area of the map with the ink filling our color. Once conquered, we begin to subtract points to the opposing team just to keep it under our control, so you can imagine that they tend to produce, as it is a method that brings together all players in the same point to it is a constant battle. As we go up to level 10, we have yet to delve into this mode, although first impressions with it have been very good. The matchmaking system has surprised by the speed at which it works, because right now we're playing in a version for press, so the number of users with the game today is very low, something that has not been us prevented find items in seconds and no timeouts almost. And if that were not enough, the stability of the servers is commendable: no lag whatsoever any foreign drops, making the online Splatoon the best we have ever seen in a Nintendo game. All a joy, so hopefully remain so when it hits stores (and after the successful outcome of the demo that was held last week, we have every reason to be optimistic). 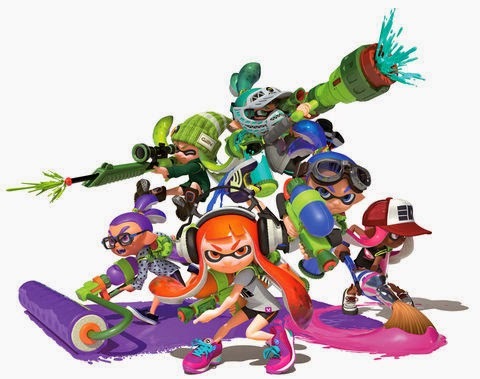 But Splatoon not live only on its online aspect, since we also have two offline modes. The first and most important is its single-player campaign, you could try almost as if it were a completely different game, but making use of the gameplay mechanics of Splatoon. Here are thirty levels (counting of bosses) that will lead to an adventure very classic 3D platforms and at times remind us that jewel called Super Mario Galaxy for its approach (although relatively speaking). Here our goal is to get from point A to B as we move through different floating islands facing a host of octopus and beating platforms will force us to implement every single one of our abilities. It is still too early to assess it as we go through only half, although all levels have played so far have managed to offer a totally new and unique mechanics that made them different from the rest. Forward dodging missiles painting, invisible platforms we had to paint so that they can see, scaled by structures with mobile platforms, sponges enlarge our painting and become small with octopuses, battles against enemies that move like us , spectacular final bosses of classic cut, and so on. An arrangement that is so far liking us and shows all the imagination and inventiveness to the design levels that Nintendo has been characterized over the years and while no longer an "extra", is making us have a great time. In addition, each screen is a scroll that is often hidden more or less hidden, which adds a touch of gameplay. Our only downside for now is that we are looking very easy (have not died yet not once in all so far), but we'll delve more about it in his analysis when we complete. The other offline so we have a kind of Versus mode (supports local play) where we have to compete in one on one for the player who more balloons burst. This mode is turning us loose the whole game, but in fact no longer be a kind of way to practice to train before making the leap to online. Graphically the title looks great, with all the usual colorful Nintendo games with an art section that shows a lot of personality and imagination, as well as good character modeled. The scenarios are also very careful and full of details and the effect of ink on impact on each surface is actually achieved, resulting even tremendously satisfying. And all this moving at a robust rate of 60 frames per second, which brings a lot of fluidity to the whole. The only thing that has not finished convince us too is the lack of good anti-aliasing because the saw teeth are more visible than we would have liked (and made to order, a resolution of 1080p instead of 720p would not have been de plus). The sound is also very good standard, with catchy soundtrack that puts us squarely on each item, rising levels of frenzy and adrenaline of fighting. Moreover, the effects are really good. In short, we're having a great time with Splatoon, to the point of having found playing up to three hours more after saying first "one more game". While we have detected some more or less serious absences (where is our voice chat, Nintendo?) And an apparent lack of original content (two online modes and five multiplayer maps out) we want to see how much influence fun in its medium and long term, the new exclusively for Nintendo Wii U can not paint better, literally.